Congress’s refusal to enact climate legislation during President Obama’s second term led the U.S. Environmental Protection Agency to seek to regulate greenhouse gases under the Clean Air Act. EPA’s “Clean Power Plan” sought to regulate the historically largest source of greenhouse gases in the U.S. economy — the CO2 emitted by electric power generating plants. Virtually all economists agree that even the best-designed regulatory approach is likely to be more costly and less effective than an economy-wide carbon price, as (then) EPA Administrator Lisa Jackson conceded in her 2009 testimony to the House Energy and Commerce Committee. As EPA marched forward with regulation, some conservatives and libertarians began urging Congress to replace EPA’s complex sector-by-sector regulatory approach with an economy-wide carbon tax whose revenue could be used to reduce other taxes. 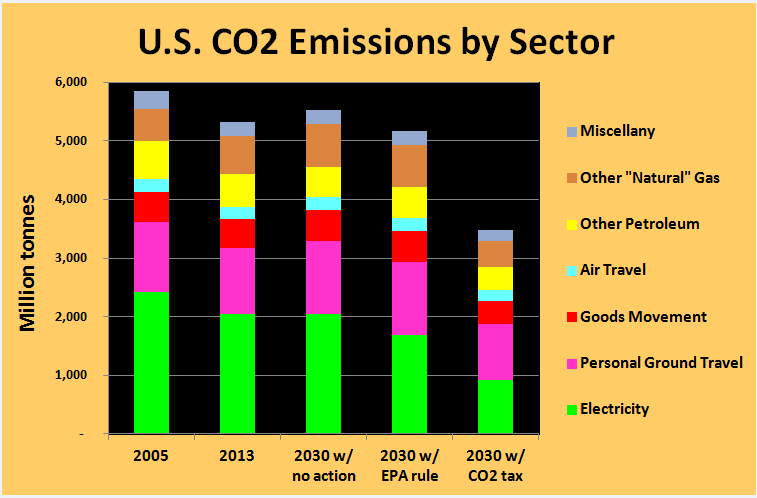 The graph below stacked up baseline emissions in 2005 and 2013 against emissions projected by CTC’s carbon tax model for 2030 under three scenarios: “business as usual (with no carbon price),” the EPA’s Clean Power Plan target of a 30% reduction in power-sector emissions from 2005, and the deeper reductions from the carbon tax proposed by Rep. Jim McDermott (D-WA). Take a close look at the green segments representing electricity generation, the only sector covered by EPA proposals to date. You’ll find more details about our analysis and comparison of EPA’s proposed rule to Rep. McDermott’s proposal in our post, Next to Nothing for Climate in Obama Plan (6/2/14). “The Politics and Economics of Obama’s New Climate Program” by CTC board member Robert Shapiro (7/2/13). “Obama’s Power Plant Plan Won’t Work” by David Bailey and David Bookbinder (Politico, 7/16/13).